Thinking of ways to get the most of your backyard this fall? Whether you are considering revamping your existing outdoor living area or are planning to build it from scratch, these tips below will help you create the perfect fall-friendly outdoor living space. Your outdoor furniture is going to take a beating. Sun, snow, rain and wind can quickly make inferior quality outdoor furniture look weathered and worn. When exploring your outdoor furniture options, look for basic sets which are made from heavy and durable materials. You can dress up this furniture with less expensive elements to make it look more engaging, such cozy blankets and soft, supple pillows. Covering your outdoor seating area will not only provide you with much needed shade in the summer months; it will also help you keep in the heat when the temperatures start to drop. A cover such as a pergola or a large and sturdy umbrella will go a long way in keeping you comfortable while outdoors this fall. 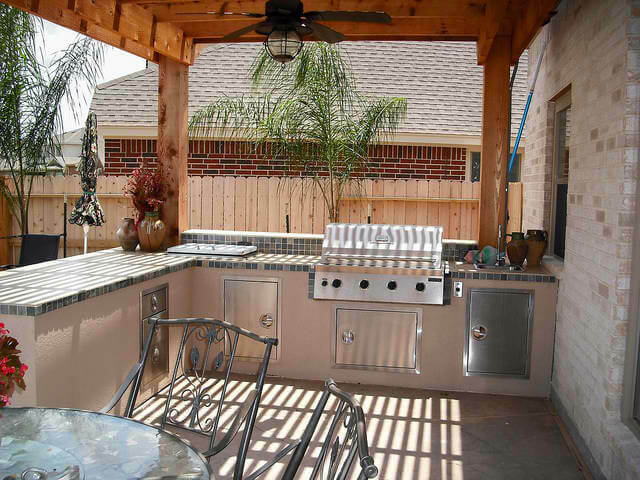 If you are planning on doing a lot of outdoor entertaining this fall, consider going beyond the barbeque and having an outdoor kitchen built. This not only encourages guests to stay outside and enjoy your beautiful backyard, but it expands your living space.